Turkey's Fix for the "Kurdish Problem"
From the beginnings of modern Turkey, the Kurds have been considered outsiders, often not even allowed to speak their own language without the threat of punishment. With Mustafa Kemal Atatürk modeling the nascent republic on the somewhat ethnically homogeneous European nation-states of the time, and the constitution declaring that "the Turkish state, with its territory and nation, is an indivisible entity," there was little room for permitting, and certainly not encouraging, the open expression of disparate ethnic or national identities within Turkey's borders. Instead, Ankara's answer to the "Kurdish question" has been, more often than not, to deny the existence of the Kurds altogether and simultaneously to attempt to pacify the region militarily, crushing all dissent while forcibly assimilating its "mountain Turk," that is Kurdish, population. One way in which the GAP serves Ankara's purposes in dealing with the "Kurdish question" is in the forced relocation of Kurdish populations who can then be broken up into smaller groups and dispersed throughout Anatolia. Here the residents of Kurdish-majority Hasankeyf protest the government's building of the Ilisu dam that would flood their 11,000-year old town, the seat of much Kurdish history. In more recent times, the Turkish government has sought to exploit a massive infrastructure undertaking, the Southeast Anatolian Project (Güneydoğu Anadolu Projesi or GAP), as a means of resolving the Kurdish dilemma. How this project came about and how it came to be seen as a solution to a largely self-created problem is a tale unto itself with roots in the nineteenth century and the dissolution of the Ottoman Empire. Defining what is meant by a Kurd can be a difficult task. The Kurdish people presently live in large numbers in four major states—Iran, Iraq, Syria, and Turkey—speak numerous languages alongside Kurdish, which itself has several different dialects, and profess several different religions besides the predominant one, Sunni Islam. Kurdish world population is estimated at thirty million, the largest ethnic group without its own state. The Kurdish population in Turkey is estimated to be between ten and twenty million; such a wide range reflects the difficulty of obtaining population statistics for a people that has been for a long period of time denied existence by the state. Whatever the precise numbers, the Kurds are clearly the second largest ethnic group within the Turkish state behind the Turks themselves. Kurds can be found in all of Turkey's geographical regions but are concentrated in the eastern and southeastern sections of the country. In the aftermath of World War I, the Allied powers attempted to split the Ottoman Empire into a rump Turkish state, a series of great-power "zones of influence," and a few independent states for minority populations, one of which was for the Kurds. This 1920 Treaty of Sevres firmly planted the idea in the Turkish psyche that the West had conspiratorial designs against the Turks. In this view, the formation of any Kurdish entity would inevitably weaken the Turkish state. While there had been clashes with Kurdish leaders in the late Ottoman period, largely in conjunction with the government's centralizing initiatives, tensions between the Kurds and the Turkish government came to a head in 1925 with the Sheikh Said rebellion. The rebellion sought a degree of independence, or at least a voice, for the Kurdish peoples of Anatolia. This threatened the Kemalist idea of a unified secular Turkish state. The revolt was crushed by the Turkish military; martial law was declared, and fifty-two thousand Turkish troops were introduced into predominantly Kurdish regions. Subsequent Kurdish rebellions, in Ararat in 1930 and Dersim in 1938, were similarly met with force and crushed by Ankara. A 1927 law allowed the Turkish government to forcibly relocate "an indefinite number of Kurds" from the southeastern provinces while the 1934 Law No. 2510 granted the state the power to assimilate forcibly or "evacuate" areas of the country with "non-Turkish culture" or language. Thus the Kurds were viewed from an early date in the history of the Turkish Republic as a threat that demanded a firm government response. Beginning in 1978, Turkey's political order began to spiral out of control, leading the military to intervene and culminating in a 1980 coup, which led to the drafting of the constitution of 1982. But while the military went back to their barracks in 1983 to make way for a return of civilian government, their intervention had a devastating impact on the Kurds. The religious threat to Turkey's newly-created, secularist identity was one of the key pretexts to the military intervention, and the members of the general staff focused on the Kurdish population as part of the problem. One method employed by the generals in an effort to defuse tensions was to establish a "village guard system" that provided tribal leaders in southeastern Anatolia who demonstrated loyalty to the state with weapons and funds to pacify their territory. However, this system only increased hostility toward the state by many Kurds as it resulted in deepening tribal tensions between those backed by the state and those who were not. Meanwhile, the Kurdistan Workers' Party (Partiya Karkerên Kurdistan or PKK), which had begun to attack the machinery of government in the late 1970s, increased its violent activities, directly targeting the village guards. The PKK received support not only from Kurds within Turkey's borders but from external sources, including the Soviet Union, and the Kurds of Iraq, Syria, and Iran, as well as from the Syrian government, which sought to weaken Turkey. As the 1980s progressed and the village guard system failed to provide the security sought by the state, the government imposed a state of emergency in 1987, which lasted until 2002. During this period, 378,335 Kurds were forced to evacuate their villages while 55,371 were arrested on charges relating to terrorism. In the 1990s, the unofficial war between the Turkish government and the PKK ebbed and flowed, alternating between periods of escalating conflict and temporary cease-fires. As a consequence of the 1991 Kuwait war and the establishment of a no-fly zone in heavily Kurdish northern Iraq, the PKK was provided a safe haven from which it could launch operations on Turkish targets. Turkey's border, flag, and official language cannot be debated, but ethnic groups [sic] demand to retain their own ethnic identity and culture should not be rejected … They have their own history, language, and folklore. If they wish to develop them, let them do so. PKK leader Abdullah Öcalan joined in similar sentiments, but the thaw abruptly ended when clashes between Kurds and Turkish soldiers broke out surrounding the 1991 Newruz New Year celebrations, originally a Persian holiday but long observed by the Kurds. A later 1993 unilateral cease-fire, declared by Öcalan, failed to "translate into concrete actions" despite rhetorical support by Ankara. Under Prime Minister Necmettin Erbakan (June 1996-June 1997), the Welfare Party (RP) made overtures to the Kurdish population; the RP included Kurds and Turks in their proposed "Islamic nation" and advocated a poorly defined "just solution" to the Kurdish problem as well as advocating lifting emergency rule in the southeast. The Kurdish population, however, was less receptive to the cause of Muslim unity than to defending its Kurdish identity, and in any event, the RP's weakness made carrying out its policies difficult. Instead, most of the decade witnessed continued military control over the "formulation of Turkey's Kurdish policies" due to "divisions within the civilian elite and [the civilian elite's] abdication of control over all aspects of the operations in the southeast against the ongoing insurgency." But by the late 1990s and early 2000s, events steered the Turkish government toward an evolving policy vis-à-vis the Kurds. The staging of Turkish forces on the Syrian border in 1998 led to the exile from Syria, and eventual capture by Turkish forces, of Abdullah Öcalan. With the PKK leader in custody, the organization made a transition to peaceful opposition at the urging of Öcalan, who declared that the Kurds "want to give up the armed struggle and have full democracy." The current governing party of Turkey, the Justice and Development Party (Adalet ve Kalkınma Partisi, AKP), has sought a solution to the problem with a much publicized "Kurdish initiative." However, any progress on the issue must overcome a variety of obstacles, foremost the resurgence of an armed PKK. After the cease-fire declared by Öcalan in 1998, as well as additional cease-fires in 2002 and 2010, conflict continued to boil to the surface. Following the June 2011 election and the revoking of the previous year's cease-fire, Öcalan called for the PKK's removal of arms from Turkish soil in March 2013 in a cease-fire agreement, which has lasted to date. Since 2011, Ankara has been forced to deal with the PKK within the context of responding to turmoil and changes with two of its own neighbors. Turkey's response to the ongoing conflict in Syria and the uprising seeking to oust President Bashar al-Assad has effectively ended its "zero problems with neighbors" policy. As of July 12, 2013, there were 381,462 Syrian refugees registered with the United Nations in Turkey with over 400,000 estimated to be in the country. These numbers pose a problem for the Turkish government as they remain in the southeastern, largely Kurdish portion of the country. Prime Minister Recep Tayyip Erdoğan's call for the removal of Assad triggered a counter-response by the Syrian government that has allowed the PKK to fill a power vacuum in the territories near the Turkish border. The Party of Unity and Democracy, the PKK's Syrian offshoot, has so far held its grip on power in the region, forcing Turkish foreign minister Ahmet Davutoğlu to declare that Kurdish autonomy in northern Syria would be acceptable in a post-Assad environment. Coinciding with this public acceptance of Kurdish autonomy in a bordering state, Turkey has supported the Kurdistan Regional Government (KRG) in Iraq as the KRG has assisted in efforts to contain the PKK on its soil. Meanwhile, Ankara's own relations with the government in Baghdad have soured: A proposed Turkish-KRG oil pipeline would bypass the Baghdad government and would provide the Kurdish government in northern Iraq with a source of independent funding. The quid pro quo in this relationship relies on the KRG's ability to assist in containing the PKK. Iraqi Kurdistan president Masoud Barzani's call for the PKK to "lay down its arms" or else "bear the consequences" has demonstrated that the KRG is seeking better relations with Turkey to provide support against the government in Baghdad. While Turkey has shown its support for Kurdish autonomy in Syria and Iraq, within its own borders, Kurdish autonomy is still viewed as a threat, despite the PKK and other Kurdish groups' official statements that they no longer seek an independent Kurdistan but rather equal rights within the state. Erdoğan responded characteristically that Kurdish calls for a federal structure were "[d]aring to abuse the democratization efforts in order to subvert national unity … a political assassination directed against the nation's will." For the foreseeable future, the Kurds will remain a marginalized and excluded group within the Turkish state. The issue of how to manage the Turkish Kurds—specifically dealing with the reasons behind and solutions to the violence that recurs in predominantly Kurdish areas—is framed in one of three ways by the Turkish state. These frames offer differing views on why the Kurds are a problem, why they fail to assimilate into the Turkish state, and why the Kurds continue to support PKK activities. Underlying these views is the belief that the Kurdish problem is essentially one of terrorism. As a result of this premise, one viewpoint posits that the problem is primarily due to domestic Kurdish support for terrorism, necessitating population control and monitoring. This framing underlies Turkish attempts to introduce the village guard system that would secure areas for the Turkish military and create a population loyal to Turkey. Another standpoint views the Kurdish situation as a function of international terrorism. Thus Turkey's Kurdish problem is due to support received from Syria and Iraq, both from the central governments themselves and from their local, indigenous Kurdish communities; without such international support, Kurds would voluntarily join and integrate into the Turkish state. This framing blames international actors for keeping a Kurdish identity alive in order to destabilize Turkey. From this perspective, border control and pressure on foreign governments will solve the Kurdish issue. This point of view is most responsible for bilateral Iraqi-Turkish agreements that allowed Turkey to conduct several cross-border raids into Iraq in the late 1980s in pursuit of PKK terrorists. Both viewpoints are widespread within Turkey and have the support of both nationalistic political parties and the military. The final frame of reference examines the Kurdish problem from a civilizational approach, concluding that the poor socioeconomic status of the region has resulted in violence. The solution to the problem is then perceived as one of economic and social development. In practice, initiatives in this direction have resulted in forced assimilation and the social and cultural destruction of Kurdish identity. The displacement and assimilation policies of the Turkish state, dating back to 1927 and 1934 laws, were intended to weaken traditional social bonds, encourage urbanization and educational assimilation. None of these approaches to the Kurdish issue include the possibility of a rejection of the ethnic Turkic identity of the nation-state, which leaves no room for minority expression. Although, since the late 1980s, there have been moves on the part of the government to allow at least some form of Kurdish cultural or political expression, these efforts were relatively limited and often failed to translate into practice. While not mutually exclusive, each of the frames of reference outlined above leads to differing conclusions about how to proceed toward a solution to the problem. However, the project which offers solutions to all three frames simultaneously is the Southeast Anatolian Project or GAP. The history of GAP goes back to the foundations of the Turkish Republic. Atatürk called for surveying and mapping southeastern rivers within the Tigris-Euphrates basins as a starting point to harnessing their power in order to satisfy the growing energy needs of the country. The current form of the project, however, only began to develop in the 1980s. Currently, GAP is the largest internal developmental project in Turkey and is one of the largest in the world. GAP has been supported by every governing party and coalition since the 1980s. GAP covers nine Turkish provinces, an area of 75,358 square kilometers, nearly 10 percent of Turkey. The area is bordered by Syria and Iraq in the south and southeast. The population within this area is largely Kurdish, and the region itself is one of the poorest regions within the country. So far, Ankara has built 22 dams, 19 hydroelectric plants, and extensive irrigation systems on the Tigris and Euphrates rivers. It consumed 7 percent of all public investment in Turkey throughout the 1990s and has continued apace since then. In 2009, total investment in GAP was US$4.68 billion, 14.4 percent of which was public investment according to government statistics. This was a large increase over public investment in 1990-2007, which averaged 7 percent showing a continued and, in fact, increasing public interest in the project. Initially seeking to provide power for the western regions of Turkey, GAP has since expanded to include nearly every manner of developmental initiative and has grown into a catchall developmental project. Due to international criticism over the social and environmental impacts of dams in the 1990s, the project's goals shifted to improving the economic situation, increasing political stability, and supporting urban and industrial development within Turkey. With Ankara's application to accede to the European Union in 1987 and human rights concerns voiced by the EU in the late 1990s and 2000s, the project began to emphasize "the need for community participation, improved basic education, health, and social services, the advancement of women, the creation of more employment opportunities, efficient use of resources, and environmental preservation." While the stated goals of GAP may be to increase agricultural trade—especially to the Middle East—and to provide social and economic development, so far it has only served to increase power generation within Turkey. There has been little progress in any other sector with regional employment in particular showing few gains. Despite decreasing economic dependence on agriculture, the high level of government spending on GAP would indicate that GAP is more a nationalistic, political project than an economic one. While some economic benefits are expected to accrue, GAP mainly serves the political goal of addressing the Kurdish issue. Internationally, GAP serves a public relations function, something that can be sold to foreign investors and governments to show that Turkey is attempting to make progress on human rights and environmental concerns. GAP was cited by the Turkish government as a fulfillment of the Copenhagen criteria for Turkey's entrance into the EU. This repackaging occurred without any major change in the schedule of construction or its ultimate goals. The fact that the main focus of the program could switch from irrigation and electrical generation to one that sought environmental, social, and health benefits demonstrates that it was merely a rebranding decision on the part of Ankara. GAP is in essence a program whose major goal is internal security and homogenization of the state. In fact, the international PR campaign is less important to the state than issues of domestic security. Turkey has, in several instances, continued controversial GAP projects, such as the Ilisu dam, despite international concerns and withdrawal of foreign investment. When European capital pulled out, due to projected environmental, cultural, and social damages, Turkey merely sought funds from China and chose to increase government funding for the dam. Negative European perceptions, even when the campaign for EU membership was in full swing, were an acceptable price for Turkey. GAP was begun for "domestic political reasons" in order to "dilute potential Kurdish national aspirations for an independent homeland." Thus, the perceived domestic benefits of the project, especially potential political stability, far outweigh any resulting international tensions with neighbors or the loss of European support. GAP can be seen as a response to the three viewpoints through which the Turkish state perceives the "Kurdish question." When one views the Kurds as a domestic terrorism problem, increased governmental control and monitoring of the local population is necessary. GAP addresses this by using dam projects, such as the Ilisu, to cut off routes that the PKK use while reservoirs, such as the one behind the Keban dam, force the local population to use the limited number of military-controlled ferries for transport. This centralization of transport allows the military to monitor the inhabitants closely, transforming water control into a method of population control. Looking at the Kurdish issue as an international terrorism problem shifts the focus to PKK support from neighboring states and their Kurdish populations. GAP serves to limit the international dimensions of Ankara's Kurdish problem by creating a giant water moat between Turkey, Iraq, and Iran. The eleven dams envisioned in this project serve little purpose in generating hydroelectric power—the Ilisu dam, for example, will produce only an estimated 2 percent of Turkish electrical needs—or in providing irrigation for a sparsely populated region. Instead, their main function is to make it difficult for the PKK to receive supplies or to operate across Turkey's borders. According to analysts Soner Cagaptay and Altay Sedat Otun, these dams would flood the canyons and terrain utilized by the PKK, providing the Turkish government with a "hydro-victory" against the Kurdish rebels. The string of dams along the border with Iraq in the Sirnak and Hakkari provinces would make any PKK incursions into Turkey more difficult while generating only token amounts of hydroelectric power. GAP has also provided the Turkish government with an effective tool for pressuring neighboring governments. It has limited water flow to downstream nations, particularly Syria, and reduced overall water quality because of agricultural runoff and other pollutants. The resulting control over water flow allowed Turkey to threaten Syria with a cutoff of water in 1998, which in turn compelled Damascus to end overt support for the PKK and forced Öcalan out of the country. GAP has also prompted the construction of new military roads and bases in the border regions, both to protect the dams and to allow ease of military transport. This increased ease of transport helps the military combat the externally-based PKK irregulars. The ruling AKP party has, more recently, emphasized the socioeconomic framing of GAP over the terrorist perspective, which was in vogue in the early and mid-1990s. This avoids ruptures with the AKP constituencies in the southeast and increases AKP support by Turkish businesses and industry while effectively continuing the antiterror strategy, which has the support of the military. But it also has important and potentially destructive ramifications for the Kurdish way of life. While GAP will purportedly industrialize the region, it will also force the urbanization of the population in the southeast by forcing Kurds from their ancestral homes. This serves to eliminate traditional social and cultural networks and encourages the breakup of families. Displaced rural Kurds are encouraged to move to cities where educational opportunities are supposedly available. Living in cities, however, also forces Kurdish assimilation into "mainstream Turkish society and culture." Within seemingly benign official language, GAP's website boldly declares its intention to "enhance the presence and influence of modern organizations and institutions" and remove traditional ones "which impede development." The objectives of GAP also include creating "an infrastructure upon which local subculture elements may form a positive synthesis with the national culture." This clearly implies the absence or the inadequacy of the culture already in the area. GAP will destroy the centers of Kurdish culture and identity. For example, the Munzur dams will uproot the only concentrated population that still speaks the Kurdish dialect of Zaza. These dams will also flood battlefields associated with the 1930s uprisings, which remain important cultural and historical links for the Kurdish people. The Ilisu dam will flood Hasankeyf, one of the most important sites of Kurdish heritage with its wealth of archeological sites dating from the Kurdish-origin Ayyubid dynasty. It bears repeating that the three framings of the Kurdish issue are not mutually exclusive; in fact, solutions to one also tend to further others. The concentration of population allows for closer government monitoring (the domestic terrorism frame), but it also advances the assimilation and industrializing aims of the socioeconomic frame. Infrastructure projects, likewise, improve the economic potential of the region, but they also allow easier military access and often serve to reroute long-existing transportation networks. By reinforcing all three of these standpoints at the same time, GAP provides increased political stability to the Turkish state, resulting in its widespread support, both through time and across the political spectrum. The military supports GAP because it allows a military-oriented solution in the southeast seen through the terrorist framework. Various business groups support GAP because the socioeconomic framing of the problem opens up the economic potential of the region and increases opportunities for investments. By ignoring the underlying issues driving approaches to the "Kurdish question," such as the single-minded focus on a monoethnic Turkish nation, GAP allows the state to draw support from the maximum number of domestic groups without alienating any large constituency—except, of course, the Kurds. The issue of the Turkish Kurds has bedeviled modern Turkey since its founding as a republic. Historically, the answer to the question has been to deny the Kurds' existence and to pacify their communities through military force. Beginning in the 1980s, political openings appeared to offer a new way forward, and the Southeast Anatolian Project (GAP) seemed to offer a method through which to solve it. These political openings quickly floundered, and GAP became a vehicle through which the answer to the "Kurdish question" remained stuck in traditional Kemalist attitudes toward the minority. The project provides a catchall solution to the three main ways in which the Kurdish problem is framed by the Turkish majority. GAP can solve the problem of domestic terrorism by limiting internal travel and concentrating populations, making the Kurds easier to control. GAP can solve the problem of international terrorism by providing the Turkish government with a tool with which to threaten foreign nations and by making cross-border incursions more difficult. Finally, GAP can solve socioeconomic problems by encouraging economic growth in the region while forcibly assimilating the society. Initially an electrical generation project, GAP was sold as a way to improve the economic performance of Turkey and to build up the backward, underdeveloped southeastern region within the country. This integration approach was also intended to allay many European human rights concerns about Turkey and to expedite the process of Turkish inclusion in the European Economic Community and later the European Union. Unfortunately, this has not proven to be the case. GAP has, in actuality, served as an alternative method of assimilation and government control over an area that is notorious throughout Turkish history for being difficult to dominate. Supported by other government policies, it encourages permanent displacement of Kurdish populations and the destruction of Kurdish culture. Even the regional socioeconomic improvements are implemented in a way that seeks to force the assimilation of the Kurdish population. Despite limited openings within Turkish politics and society for the Kurdish population, GAP continues to provide policy expression to the Kemalist idea of a nation-state based on the single ethnic identity of Turk. Far from developing and integrating the Kurdish populations, GAP furthers the solution of Turkey's Kurdish problem by erasing the Kurds themselves. Robert Hatem received B.A. 's in history and political science from UNC Wilmington and a M.A. in Middle East studies from George Washington University. Mark Dohrmann received his B.A. in political science from the UNC Wilmington and M.A. in international affairs from American University. The Constitution of the Republic of Turkey, 2001, amended, art. 3. Kerim Yildiz, The Kurds in Turkey: EU Accession and Human Rights (London: Pluto Press, 2005), p. 5. Kemal Kirisci and Gareth M. Winrow, The Kurdish Question and Turkey: An Example of Trans-State Ethnic Conflict (London: Frank Class, 1997), pp. 119-20. Phillip Robins, "The Overlord State: Turkish Policy and the Kurdish Issue," International Affairs, Oct. 1993, p. 659. Yildiz, The Kurds in Turkey, p. 15. David McDowall, A Modern History of the Kurds (New York: I.B. Tauris and Co., Ltd., 2004), p. 197. Haldun Çancı and Şevket Serkan Şen, "The Gulf War and Turkey: Regional Changes and Their Domestic Effects (1991-2003), International Journal on World Peace, Mar. 2011, pp. 42, 46. Robins, "The Overlord State," p. 662. James Brown, "The Turkish Imbroglio: Its Kurds," Annals of American Academy of Political and Social Science, Sept. 1995, p. 119. Abdullah Bozkurt, "Raising the Specter of Emergency Rule Brings Back Forgotten Memories," Today's Zaman (Istanbul), Dec. 20, 2009. Çancı and Serkan Şen, "The Gulf War and Turkey," p. 47. Hurriyet (Istanbul), Nov. 26, 1991. Brown, "The Turkish Imbroglio," p. 121. Henri J. Barkey and Graham E. Fuller, "Turkey's Kurdish Question: Critical Turning Points and Missed Opportunities," Middle East Journal, Winter 1997, p. 68. Kirisci and Winrow, The Kurdish Question and Turkey, p. 145. Çancı and Serkan Şen, "The Gulf War and Turkey," p. 58. Barkey and Fuller, "Turkey's Kurdish Question," p. 69. Abdullah Öcalan, quoted in Stephen Kinzer, Crescent and Star: Turkey between Two Worlds (New York: Farrar, Straus, and Giroux, 2001), p. 127. Gonul Tol, "The PKK cease-fire and Syria's Kurds," Foreign Policy, Mar. 22, 2013. On the zero problems policy, see Ilias I. Kouskouvelis, "The Problem with Turkey's 'Zero Problems,'" Middle East Quarterly, Winter 2013, pp. 47-56. "Syrian Refugees Response Regional Overview," The Office of the United Nations High Commissioner for Refugees, Geneva, accessed July 14, 2013. Financial Times (London), Aug. 22, 2012. Today's Zaman, Aug. 9, 2012. Gonul Tol, "Turkey's KRG Energy Partnership," Foreign Policy, Jan. 29, 2013. Yildiz, The Kurds in Turkey, p. 116. Today's Zaman, Apr. 20, 2012. Michael M. Gunter, "The Continuing Kurdish Problem in Turkey after Ocalan's Capture," Third World Quarterly, Oct. 2000, pp. 855-6. Kirisci and Winrow, The Kurdish Question and Turkey, p. 46. Robins, "The Overlord State," p. 664. Phebe Marr, "Turkey and Iraq," in Henri J. Barkey, ed., Reluctant Neighbor: Turkey's Role in the Middle East (Washington: United States Institute for Peace, 1996), p. 45. Kirisci and Winrow, The Kurdish Question and Turkey, p. 122. McDowall, A Modern History of the Kurds, p. 199. "Southeastern Anatolian Project," Foreign Agricultural Service, U.S. Department of Agriculture, Washington, D.C., accessed July 10, 2013. Alexendra M. Pool and Velma I. Grover, "GAPs in the Dialogue of Governance: Conflicting Ideologies of Development in Turkey" in Velma I. Grover, ed., Water: Global Common and Global Problems (Enfield: Science Publishers, 2006), p. 377. Ali Carkoglu and Mine Eder, "Domestic Concerns and the Water Conflict over the Euphrates-Tigris River Basin," Middle Eastern Studies, Jan. 2001, pp. 44-5. Pool and Grover, "GAPs in the Dialogue of Governance," p. 373. Paul Williams, "Turkey's H20 Diplomacy in the Middle Easy," Security Dialogue, 1 (2001), p. 31. "GAP," Office of the Prime Minister of Turkey, Ankara, Dec. 2010, p. 5. Anna Brismar, "The Ataturk Dam Project in South-east Turkey: Changes in Objectives and Planning over Time," Natural Resources Forum, May 2002, p. 104. Pool and Grover, "GAPs in the Dialogue of Governance," p. 380. Brismar, "The Ataturk Dam Project in South-east Turkey," p. 108. Abdullah Akyuz, Turkish politics and society, lecture, George Washington University, Washington, D.C., Apr. 7, 2011. Jan Selby, "The Geopolitics of Water in the Middle East," Third World Quarterly, 2 (2005), pp. 336-7. Pool and Grover, "GAPs in the Dialogue of Governance," p. 378. 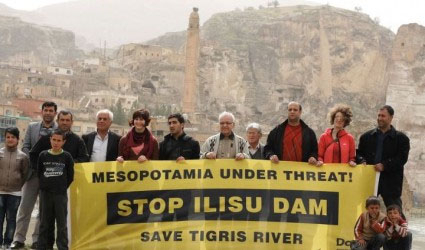 "The Ilisu Dam Project," Kurdish Human Rights Project briefing paper, London, Dec. 23, 2009, pp. 6-7. Murhaj Jouejati, "Water Politics as High Politics: The Case of Turkey and Syria," in Barkey, ed. Reluctant Neighbor, p. 136. "The Cultural and Environmental Impact of Large Dams in Southeast Turkey," Fact-Finding Mission Report, Kurdish Human Rights Project, London, Feb. 2005, p. 41. Selby, "The Geopolitics of Water in the Middle East," p. 334. Inter Press Service News Agency, June 10, 2012. Joost Jongerden, "Dams and Politics in Turkey: Utilizing Water, Developing Conflict," Middle East Policy Council, Spring 2010, p. 142. Soner Cagaptay and Altay Sedat Otun, "Flooding out terror? Turkey's Ilisu dam project," CNN World, May 3, 2012. Paul Williams, "Euphrates and Tigris Waters: Turkish-Syrian and Iraqi Relations," in Dhirenda K. Vajpey, ed. Water Resource Conflicts and International Security: A Global Perspective (Plymouth: Lexington Books, 2011), p. 44. Frederick M. Lorenz and Edward J. Erickson, The Euphrates Triangle: Security Implications of the Southeastern Anatolia Project (Washington: National Defense University Press, 1999), p. 37. Mark Adams, Water and Security Policy: The Case of Turkey (Washington: National Defense University Press, 2000), accessed Apr. 15, 2011, p. 9. Jongerden, "Dams and Politics in Turkey," p. 142. "The Cultural and Environmental Impact of Large Dams in Southeast Turkey," p. 24. "Objectives of GAP," Turkish Ministry of Development, Southeastern Anatolia Project Regional Development Administration, Şanliurfa, 2011, accessed Mar. 10, 2012. "The Cultural and Environmental Impact of Large Dams in Southeast Turkey," p. 59. Thomas Moran, "The Environmental and Socio-Economic Impacts of Hydro-electric Dams in Turkish Kurdistan," Roskilde University Digital Archive, Trekroner, Den., accessed Mar. 10, 2012, pp. 80, 82. Related Topics: Kurds, Turkey and Turks | Fall 2013 MEQ receive the latest by email: subscribe to the free mef mailing list This text may be reposted or forwarded so long as it is presented as an integral whole with complete and accurate information provided about its author, date, place of publication, and original URL.